Monster or mönster - what is the scariest to you? You know when you want to make that monster really frightening, and you end up calling it a pattern? There must be plenty of post-ignorant expats out there, laughing smugly at their idiotic co-patriots who are too naive to take those dots seriously enough. When teaching any beginner’s course, and even further up in the food chain - and this applies only to people who insist on using pen and paper despite digital advance, I always receive a certain type of written assignment. These texts have often been written rather carefully, and to make that final touch, they have been artistically decorated with randomly distributed dots and rings, to make the visual experience of the text seemingly more Swedish. Spoiler alert, you cannot fool me this way. In fact, those dots and rings - prickar och ringar, as we call them, follow a strict logic that cannot be understood from guesswork. Instead, they make three letters Å Ä and Ö, in that order. We never talk about A-Z, it is A-Ö for us, because these letters qualify as nothing but letters, not just variations on a theme. É however is just another form of E.
Added, they are vowels. 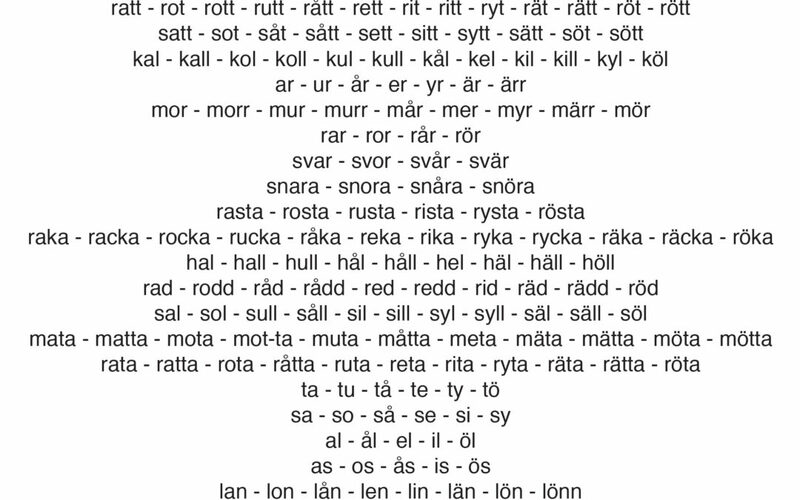 And Swedish is a language in love with vowels of all sort. Worse, they have serious implications on meanings. We are not talking about minimal pairs here, we are talking about minimal families, or extended families of words that are identical except one single letter. Sometimes, the confusion is added as the consonants following the critical vowel could come in twos as well as ones. One consonant is almost always short and automatically makes the preceding vowel long (we are measuring in time, here), whereas two consonants make a long consonant sound, following a short vowel. This means that all the following words exist, and all have different meanings. Grab some coffee, a dictionary and prepare to have your mind blown.